A fossil discovery made in Western Australia may help palaeontologists to piece together the early evolutionary history of the shark family. It seems that the very first sharks may have had bony skeletons, only later did this group evolve a skeleton entirely made up of cartilage. Fish are the most specious of all the vertebrates. There are more species of fish alive today, than amphibian, reptile, bird and mammal species combined. Fishes are certainly very diverse, but if we set aside the jawless fish for a moment (the Agnathans), plus one or two other extinct groups and focus on the jawed types, fish can be split into two specific clades. Osteichthyes – fish with bony skeletons, this is the group that gave rise to the other types of vertebrates mentioned above – the amphibians, reptiles etc. Sharks may have been around for some 400 million years but fossils of these early sharks are extremely rare and many species have been identified from very fragmentary evidence, isolated teeth, preserved scales and even dorsal spines. A team of Australian scientists have published a paper in the academic journal “PLOS One” that details the discovery of a remarkable ancient shark fossil, one that dates from around 380 million years ago and suggests that early sharks may have had bony skeletons before evolving the cartilaginous form that we know today. The fossil discovery was made in July 2005 and the specimen comes from the Gogo Formation Lägerstatte of the remote Kimberley region of Western Australia. The strata represents an ancient tropical reef environment and dates from the Frasnian faunal stage of the Late Devonian (380-385 million years ago). This location contains the richest, most diverse and best-preserved fish fossils found in Upper Devonian rocks anywhere in the world. Professor John Long (School of Biological Sciences, Flinders University, Adelaide), commented that this fossil specimen represents a transitional form of shark, from one with a bony internal skeleton to the more “modern” forms we find today with their skeletons entirely made up of cartilage. The professor holds the precious find. It had been thought that the sharks and rays represented a more primitive fish lineage when compared to their bony cousins. However, a series of discoveries coupled with new research has led many palaeontologists to suggest that it is the Chondrichthyes that represent the more advanced, derived evolutionary route. This is the first shark specimen to be discovered in the Gogo Formation, a fossil rich marine deposit that has been studied for more than six decades. The fossil material consists of the jaws, parts of the shoulder girdle along with teeth and scales. It is difficult to estimate the actual size of the shark, but Everything Dinosaur estimate that this specimen represents a fish that would have been perhaps around the size of a Smallspotted Catshark (Scyliorhinus canicula), which is a common shark in British waters and grows to 60-80 centimetres long. The picture above shows the remains of the lower jaws, which consist of cartilage and bone. In extant Chondrichthyans (fish with cartilaginous skeletons), the lower jaws are formed entirely from cartilage, this is referred to as Meckelian cartilage. However, in mature Osteichthyans (bony fish) and all Tetrapods the cartilage becomes covered in bone. To remove the fossil from the surrounding matrix, a team at Museum Victoria (Melbourne), bathed the specimen in a solution of 10% acetic acid. This acid etching technique exposed the jaws, other elements of the skeleton as well as teeth and scales. This is the first time a Devonian shark specimen has been prepared in this way. 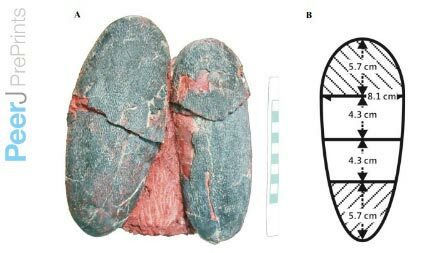 The picture above shows the specimen (B) during early acid bath preparation, whilst (C) shows the Meckelian cartilage once it has been removed from the surrounding rock. The species has been named Gogoselachus lynbeazleyae. The genus nomenclature comes from the name of the geological formation and the Greek “selachos” which means shark. The trivial name honours neuroscientist Professor Lyn Beazley (University of Western Australia), in acknowledgement of her role as an ambassador for science. As a bath of acetic acid had been used to recover the specimen, the fossil was left in three-dimensions, almost perfect, this enabled the research team to identify bone cells in the remains of the calcified cartilage. Professor Long explained that the fossil could be almost described as a “missing link” in shark evolution. It showed that early sharks had a lot more bone in their skeleton and that just before modern sharks evolved they lost the bone, with only the soft cartilage remaining. The professor stated that this indicates a direction in their evolution that shows that sharks are much more specialised than previously thought. In addition, the acetic acid bath revealed a array of loose teeth, this Late Devonian shark was clearly a predator, but the Australian research team were unable to shed much light on precisely what it might have eaten. The picture above shows one of the larger teeth found in association with the other body fossils. The top picture (A) shows the tooth in lingual view (the side adjacent to the tongue), picture B shows the labial view, a view of the teeth on the mandible that would face the cheeks or lips. With the discovery of this first shark fossil from the site, Professor Long and his field team hope to return to the location later on this year in a bid to find more evidence of ancient sharks. A scientist from Stony Brook University has reassessed a study into whether dinosaurs were cold or warm-blooded. Dr. Michael D’Emic, a palaeontologist at the New York based university, has re-examined the research in a report published last summer which proposed that dinosaur metabolism was a kind of “half-way house” between a cold-blooded reptile and that of a warm-blooded mammal. Palaeontologist Dr. D’Emic suggests that dinosaurs were not mesotherms (half-way between cold and warm-blooded), but instead their growth rates suggest that the Dinosauria are indistinguishable from the Mammalia in terms of their metabolism. Where on the spectrum between endothermic and ectothermic are the Dinosauria? Yesterday, (May 29th), Dr. D’Emic’s study was published as a technical comment in the academic journal “Science” in response to the 2014 research. In the absence of a living, non-avian dinosaur to study, the debate boils down to interpretation of the evidence and statistical analysis. But why the fuss over what kind of metabolism the dinosaurs had? We at Everything Dinosaur doubt very much that members of the public are going to be whopping and hollering about ectotherms (cold-blooded animals) or endotherms (warm-blooded) as they leave cinemas in a few weeks time having just watched “Jurassic World”, but understanding the metabolism of the Dinosauria is essential if scientists are really going to be able to learn how these animals lived and behaved. Let’s kick off with some simple explanations. What does it mean to be Cold-blooded or Warm-blooded? These terms are frequently used, but they are themselves a little misleading. These two distinct states do not define all vertebrates, things are a little more complicated than that, but in essence a creature that is regarded as cold-blooded relies on external sources to help regulate its body temperature. Typical examples are lizards and snakes basking in the sun to warm up in the morning, but then seeking much cooler shade to avoid over-heating in the middle of the day. Warm-blooded animals (mammals and birds), are able to maintain a body temperature that is higher than the temperature of the environment. In simple terms, they can generate their own body heat. This heat comes from the animal’s metabolism, the chemical reactions that take place in the body (although there are other methods of keeping cool and warming up). If the dinosaurs had the same body chemistry as a crocodile (a reptile, regarded as an ectotherm), then they would have been relatively inactive compared to large mammals. Nocturnal activity could have been reduced along with geographical distribution, very cold environments would have been extremely hostile to cold-blooded dinosaurs. This is why today, we see the majority of reptile species confined to the tropics. If the dinosaurs had the same metabolism as birds and mammals, then they would have been much more active and not reliant on external sources to help maintain a body temperature that enabled them to function. The type of body chemistry employed would impact on every aspect of their lives – migration, breeding, food intake, social interactions, growth rates, intra-specific and inter-specific competition and so forth. Take food as an example. Whether herbivore, omnivore or carnivore, an ectotherm requires a lot less food in order to survive than an equivalent sized endotherm. Lions (warm-blooded), have to feed every three to five days on average. They have high metabolisms and high food demands as a result. Nile crocodiles that live in the same environment need much less food. One substantial meal can last a Nile crocodile several months, crocs are much less expensive to run. Sunlight can provide their bodies with all the heat they need, they don’t need to create it themselves, so their bodies need less food. Over the years, team members at Everything Dinosaur have posted up articles on the ectotherm versus endotherm debate. In June 2014, we published a feature on the research carried out by student John Grady (University of New Mexico) in association with colleagues from the University of Arizona and the Sante Fe Institute. It is the results of this research that Dr. D’Emic has reassessed. Dr. D’Emic proposes that further analysis of microscopic growth rings preserved in dinosaur fossil bone, suggests that dinosaurs grew as quickly as mammals. This suggests fast metabolisms and therefore that the Dinosauria were endothermic. The earlier study had undertaken a detailed analysis on the growth rates of a wide variety of extinct and extant organisms. The research team led by John Grady concluded that dinosaurs were mostly like mesotherms. As a Research Instructor in the Dept. of Anatomical Sciences, Dr. D’Emic specialises in the study of the structure of bone. Using microscopic slices of fossil bone that has been carefully cut and polished, the doctor read growth rings preserved in the bone just as a dendrochronologist examines tree rings. He looked at the 2014 study from two specific view points, firstly the research had scaled down yearly growth rates to daily ones in order to standardise the data. He concluded that the 2014 study may have underestimated the growth rate of the different types of dinosaur included in the dataset, by failing to account for their uneven growth. Like many extant animals, dinosaurs slowed or paused their growth. This is marked by the growth rings that can be made out in micro-anatomical bone studies. The doctor added that growth rates were especially underestimated for larger animals and animals that live in very stressful or seasonal environments – both of which characterise the Dinosauria. The bands mark periods of arrested or stopped growth. Secondly, in the paper entitled “Evidence for Mesothermy in Dinosaurs”, birds in the sample studied were treated separately from the twenty-one dinosaurs that were included, In this reassessment, birds and dinosaur data was included as one homogeneous group. Birds are warm-blooded and they are direct descendants of dromaeosaur dinosaurs. Under these new conditions for examining the statistics, the birds being included in the dinosaur assessment data, lends more weight to the idea that the Dinosauria were endothermic and not the “half-way house” as mesotherms. It seems that as with virtually all studies of this nature, the way that the data is handled and the terms of reference will influence the conclusions that can be drawn. A microscopic image of the thigh bone (femur) of a dinosaur shows concentric rings. The rings represent unrecorded time, so an annual growth rate (dashed line in graph) is an underestimate relative to the true growth rate during the favourable growing season. Comments regarding this new assessment of the earlier research have already been made. For example, the team behind the 2014 study have responded to this analysis by commenting that the new study raises a number of important statistical and methodological questions, however, the proposals made lack biological and statistical justification. All scientists who step bravely into this area of academic endeavour deserve our admiration, both papers are part of the rich and extremely diverse range of research that has gone into tackling this very thorny problem, it seems that the warm-blooded versus cold-blooded debate is likely to rumble on. Had you and I been able to travel back in time to the Afar region of northern Ethiopia some 3.4 million years ago in a bid to meet our ancient ancestors, we might have been spoilt for choice when it comes to trying to work out from which species we are descended from. Lucy* the most famous example of Australopithecus afarensis had company, she had neighbours, a newly described species of Australopithecine has just been announced. Two fragmentary upper jaws along with two fragments of lower jaws, representing fossil material from three individuals were found in March 2011 in the Woranso-Mille area of the Afar region. These fossils have been assigned to an entirely new genus of Australopithecine, say hello to Australopithecus deyiremeda. A new Australopithecus species has been described. The fossil material assigned to Australopithecus deyiremeda (pronounced ost-tral-oh-pith-e-kus day-ihremy-dah) was described by a team of international palaeoanthropologists led by Dr. Yohannes Haile-Selassie, the Curator of Physical Anthropology at the Cleveland Museum of Natural History (Cleveland, Ohio). The fossils are estimated to between 3.3 million and 3.5 million years old, which means that this species overlapped and lived in the same region as Australopithecus afarensis, the species that the famous fossils called “Lucy” have been assigned to. However, although A. deyiremeda and A. afarensis lived at the same time and shared the same habitat, the “Lucy” fossil material has been dated to 3.2 million years ago, meaning that the most famous representative of the Australopithecus afarensis species – “Lucy” lived more recently and could never have met the individuals whose jawbones have been preserved. The upper jaw (holotype) found on March 4th 2011. The picture above shows a field photograph of the holotype (upper jaw), five teeth can be clearly seen. The discovery of this new species is significant for a number of reasons. This is the first irrefutable evidence of two species of Australopithecine co-existing. These two species lived at the same time in the Middle Pliocene and in the same part of the world. These fossils suggest that the Australopithecus genus was more diverse than previously thought, it had been thought that the Homo genus evolved from A. afarensis but this may not have been the case, a number of candidate species are emerging. The morphology of the jaws, the size and shape of the teeth and their enamel thickness suggest characteristics not found in A. afarensis but more akin to later genera, the Paranthropus and the Homo genus, for example. These traits go back much further in time than previously thought. A lower jaw fragment of A. deyiremeda. The academic paper that details this discovery has just been published in the journal “Nature”. In recent years, the hypothesis of a relatively simple, linear progression from Australopithecus to the Homo genus and ultimately the origin of our own species has become less popular amongst researchers. It seems the hominin family tree is much more complicated than previously thought. The left portion of the lower jaw, prior to cleaning. “The new species is yet another confirmation that Lucy’s species, Australopithecus afarensis, was not the only potential human ancestor species that roamed in what is now the Afar region of Ethiopia during the Middle Pliocene. Current fossil evidence from the Woranso-Mille study area clearly shows that there were at least two, if not three, early human species living at the same time and in close geographic proximity. This new species from Ethiopia takes the ongoing debate on early hominin diversity to another level. Some of our colleagues are going to be sceptical about this new species, which is not unusual. However, I think it is time that we look into the earlier phases of our evolution with an open mind and carefully examine the currently available fossil evidence rather than immediately dismissing the fossils that do not fit our long-held hypotheses”. A field photograph of a nearly complete lower jaw fossil with teeth. This discovery raises the question of how multiple types of early hominins may have been able to co-exist in the same environment. For those readers unfamiliar with the term hominin, a hominin is defined as a species more closely related to humans than to our closest extant ape relative the chimpanzee. Clues can be found in the fossilised jaws and teeth. The jaws of A. deyiremeda are very deep and robust, but the teeth are proportionately smaller than seen in other Australopithecines. The canine teeth are particularly small, smaller than all known hominins that have been described previously. The jaws and teeth may reflect adaptations to a different type of diet. The size of the canine teeth may also be very significant. We have four canine teeth, two in the top jaw and two in the lower jaw. They sit between the first premolar and the last incisor and the size of the canine teeth can provide evidence about social behaviours associated with a species. In primates, where males compete with each other over females, the canine teeth of the males are usually much larger than the canines of females. Canine teeth can be used as weapons as the males fight each other to establish social hierarchies and dominance. Teeth can tell us a lot about an extinct creature. If more teeth ascribed to A. deyiremeda can be found, then more research can be undertaken on the potential dietary differences between different hominins and some exciting inferences about social behaviours and social structures could be made. Everything Dinosaur, acknowledges the contribution of the Cleveland Museum of Natural History in the compilation of this article. Washington State 37th U.S. State with a Dinosaur? Which States in the USA Don’t Have Dinosaur Fossils? Everything Dinosaur’s recent article on the describing of a dinosaur fossil bone found on Sucia Island (Washington State) set team members thinking. The fossil, which is believed to represent the partial left femur of a tyrannosaurid was the first dinosaur bone to be scientifically described from Washington State. A number of media sites and scientific publications that covered this story listed Washington State as the latest and thirty-seventh U.S. State to have had dinosaur fossils discovered within its boundaries. Of the fifty States that make up the USA, more than two-thirds of them are associated with the Dinosauria, either body or trace fossils or both. Details of the partial left femur. So what about the remaining thirteen States in America, those inferred not to have dinosaur fossils? Is this a case of there being none found as yet or does the fossil discovery in Washington State represent, in all likelihood, the last State in the United States to be added to the “dinosaur club”? Which States Don’t Contain Dinosaur Fossils? Identifying the thirteen States* that don’t contain dinosaur fossils is quite a tough ask for a company this side of the Atlantic. However, team members at Everything Dinosaur have been putting their heads together and have come up with the following list (which may or may not be accurate). Hawaii – the Hawaiian archipelago was the fiftieth and most recent State to join the USA. As it is almost entirely made up of volcanic rock (igneous) and since it is a relatively recent geological feature, probably less than six million years old, we can state with confidence that no dinosaur fossil material will be found in the island’s rock formations. That’s the easiest one out of the way. Florida – the “Sunshine State” it might attract millions of tourists but there are very probably no dinosaur fossils to be found. The landmass we know as Florida today did not form in the Mesozoic. Louisiana – in the north-western portion of the State, there are some small outcrops of marine shales that were deposited in the Late Cretaceous. As far as we know, no dinosaur fossils have been associated with this strata (located around Bienville Parish). It is extremely unlikely that dinosaur fossils could be found in Louisiana, but it could happen. Mississippi** – the Mississippi river and delta deposits are far to recent to provide the opportunity to find dinosaur fossils. However, in the far north-east of the State there are small exposed areas of Upper Cretaceous aged marine deposits, predominately chalk. As far as we know no dinosaur fossils have been found and it is extremely unlikely, however, if you were to go and look, try around Ponotoc and Union Counties – we wish you luck. South-east USA sorted (we think). West Virginia – moving up the eastern seaboard of the United States, the next candidate is West Virginia. As far as we know at Everything Dinosaur, there are no sedimentary rocks dating from the Mesozoic to be found in this State, erosion and other forces have removed them, therefore no dinosaur fossils. Rhode Island – the smallest State in the USA. Triassic and Jurassic sedimentary deposits are absent (we think), very few Cretaceous outcrops present, so no dinosaur fossils. New Hampshire – erosion of sedimentary materials and intrusions of igneous and metamorphic rocks leaves virtually no Mesozoic aged sedimentary formations in the State. We don’t think any dinosaur fossils have been found here. Vermont – Triassic and Jurassic aged sediments eroded away and very little Cretaceous aged deposits exposed. All of these Cretaceous deposits not fossiliferous, so no dinosaur fossils as far as we know discovered in Vermont. Maine – in the far north-east of the United States there is a huge gap in the geological record with most Late Palaeozoic, Mesozoic and Cenozoic fossils eroded away (blame the glaciers and so forth). As a result, once again, as far as we know dinosaur fossils recorded from the State of Maine = zero. So that’s the eastern seaboard and the far north-east taken care off. Michigan – still in the Eastern Time Zone, but no dinosaur fossils have been found on either peninsula that make up this State. Lots of invertebrates et al, but no dinosaurs (we think). Ohio – thanks to glaciation and other forms or erosion, Mesozoic aged sedimentary rocks are virtually absent. Dinosaurs did probably roam in this part of the world but their fossils have long since be eroded away. Indiana – just like its eastern neighbour Ohio, blame the glaciers for the loss of the Mesozoic strata. So no dinosaur fossils in Indiana either, but just like in Ohio, they did probably live in this neck of the woods. Kentucky – south of Indiana to the “Bluegrass State”. As far as we can work out from our own notes, there are few Mesozoic rocks exposed (eroded away no doubt). Some Cretaceous aged outcrops are present and we have some tentative notes of plant fossils from the Cretaceous, but alas, no evidence of the Dinosauria. Hold on a minute, that should be it, but we still have some more States to go. Illinois – into the Central Time Zone but just like its eastern neighbour Indiana, erosion has led to the removal of much of the Mesozoic strata. Some Cretaceous-aged deposits can be found in the south of this State, but as far as we know, although dinosaurs may have lived in this part of the world there is no fossil evidence for them. Wisconsin – substantial erosion has removed the dinosaur fossil bearing strata, so according to our notes and database, there are no dinosaur fossils associated with the State of Wisconsin. Dinosaur Fossils by U.S. State. According to our research, the figure of thirteen U.S. States not having dinosaur fossils associated with them is inaccurate. Of course, our own database could be wrong but we make it fifteen States without any evidence of the Dinosauria. Thanks to mountain building, glaciation, the construction of huge urban developments and the fact that parts of the United States simply did not exist during the time of the dinosaurs, these are the States that lack any dinosaur fossils. We admit, we could have got this wrong and we would welcome any comments to help provide a more accurate picture. Thanks to J. Slattery for helping with this, we have received information about Late Cretaceous dinosaur fossils from Mississippi**. It seems that in some uncovered outcrops of Upper Cretaceous age which represents shallow marine deposits, fragmentary dinosaur fossils (teeth and bones) have been found as a result of what we tend to call “bloat and float”. A dinosaur carcase being washed out to sea and then being scavenged before sinking and settlement. News broke this week of the discovery and subsequent description of a partial left femur from a Theropod dinosaur that had been found on the south-west tip of Sucia Island, which is part of Washington State. This is the first time that a dinosaur fossil has been recorded from Washington State. Sucia Island is part of the San Juan archipelago group of islands, it is a conservation area, part of a marine park (Washington State Marine Park). Sucia Island is very small, it covers approximately 0.88 square miles, making the island about the size of the Queen Elizabeth Olympic Park in London, the site of the 2012 Olympic Games. The shoreline where the fossil was found. The fossil was collected by a team of palaeontologists from the Burke Museum of Natural History and Culture (Seattle) in May 2012. The partial femur was located in very hard, silty sandstone rocks which represent a shallow marine environment. The discovery of the fossil had been made earlier by Burke museum field workers who had been excavating Ammonite fossils and other invertebrates from the same bed. It has taken three years to prepare the fossil for further study by carefully removing the extremely hard matrix and then to identify what type of animal the partial thigh bone might represent. Based on comparative studies the bone has been ascribed to a Tyrannosaur, but more about that later. Dr. Christian Sidor (right), Burke Museum curator of vertebrate palaeontology, and Brandon Peecook (left), University of Washington graduate student, show the size and placement of the fossil fragment compared to the cast of a Daspletosaurus femur. This really is an example of the right people, in the right place at the right time. Occasionally vertebrate fossils are found in marine deposits, in the United Kingdom, the Dorset coast provides an example of this. The “Jurassic Coast” around Charmouth and Lyme Regis in Dorset represent a shallow marine environment but the fossilised bones of a dinosaur (Scelidosaurus) have been found. It seems likely that the corpses of dinosaurs were washed out to sea and once the body cavity had ruptured the carcase sank to the bottom and became covered in sediment permitting the fossilisation process to begin. The picture above shows Dr. Sidor holding the partial femur fossil, Brandon is holding a cast of femur from a Tyrannosaur called Daspletosaurus (D. torosus) to allow a visual comparison to be made. Both scientists are showing the back view of the objects (the posterior view), the photographer is looking at the back of the fossil, this is important to note as an anatomical feature located at the back of the fossil bone is helping palaeontologists to classify the sort of dinosaur the Washington State bone represents. To find a dinosaur fossil in an marine environment is very rare and given the strong waves and tides associated with Sucia Island the fossil material could have been quickly washed out to sea and lost forever, so it really is a question of the right people being in the right place at the right time. The analysis and identification of the femur was undertaken by Dr. Sidor (Burke Museum of Natural History and Culture) and Brandon Peecock (University of Washington), their paper has just been published in the on line journal PLOS One. It is highly unlikely that other fossils related to this individual will be found at the site. To answer this question we first have to take a step back. How do we know that this is a dinosaur bone in the first place? The fossils are found in a horizon that makes up a member of the Cedar District Formation, Upper Cretaceous strata that outcrops along the north-western coast of the United States and the extreme southern portion of the Canadian Pacific coast around Vancouver. The exact age of these rocks is debated, but the rocks were probably laid down in the Campanian faunal stage and are perhaps around 80 million-years-old. During this time, in the Late Cretaceous, North America was divided into several landmasses by the Western Interior Seaway. The island of Laramidia lay to the west and this strip of land is represented by strata found in Alaska all the way down to Mexico on the western seaboard of this continent. Dinosaurs were the dominant terrestrial megafauna and much is known about the dinosaurs that roamed the eastern side of Laramidia. Less is known about those from the western provinces of this landmass, this is due to the relative paucity of fossil material found to date on America’s Pacific coast. Hence the significance of the Sucia Island discovery. The Sucia Island fossil site is 3 (highlighted in red). Although only a fragment of the top part of the femur (see picture below to gain an understanding of which part of the thigh bone has been preserved), the fossil measures a whopping 42.5 cm long and 22.4 cm wide at its widest part (the top end of the fossil, this represents that portion of the femoral head that articulates with the hip socket. This fossil is from a very large animal, hence the confident dinosaur diagnosis. The researchers writing in PLOS One undertook a comparative analysis study, comparing this fragment to the bones of Theropod dinosaurs. Based on this analysis, the projected actual size of this thigh bone would be about 1.17 metres long (1.167 metres +/- 63 mm with 95% degree of confidence in the result). Although the bone is fragmentary, there is evidence of matrix infill in the medullary cavity (the middle of the bone, where marrow was present). This indicates that this bone was hollow in the middle, this feature is only seen in Theropod dinosaurs in this geological period. Thus, the hollow middle cavity is diagnostic of this bone having come from a Theropod dinosaur. An anatomical feature on the back of the thigh bone (posterior), called the fourth trochanter suggests a Theropod dinosaur. The fourth trochanter is a prominent bump or ridge of bone that indicates muscle attachment. In this specimen, the fourth trochanter is located in the top third portion of the thigh bone, close to the hip socket. Its shape and position on the bone suggests Theropoda. All dinosaurs (all archosaurs for that matter), have this characteristic, but in other big, Late Cretaceous dinosaurs such as Ceratopsians and Hadrosaurs, the fourth trochanter is shaped differently and in a different position at the back of the femur. In hadrosaurids for example, the fourth trochanter is located near the middle of the femur and is triangular in shape. In horned dinosaurs (Ceratopsians) the fourth trochanter is typically a long, low, straight ridge, which is also positioned towards the middle portion of the thigh bone. An illustration of the fossil find. If you look carefully at the picture above, the bottom end of the fourth trochanter is wider and roughened (distal end). The top portion (proximal) appears smooth and thinner. A similar morphology is found on the fourth trochanter of the Late Cretaceous Tyrannosaur known as Daspletosaurus (D. torosus). This explains why the research team have tentatively assigned this fossil fragment to the Tyrannosaur family and used Daspletosaurus fossil material as a direct comparison. Larger Tyrannosaur present in the ecosystem. The partial thigh bone, now tentatively assigned to the same dinosaur clade as Tyrannosaurus rex is on display at Burke Museum. It is worth noting that based on the thigh bone’s total estimated size, the individual meat-eater the fossil material represents would have been over eight metres in length. The dinosaur would have been approximately the same size as a Daspletosaurus, a Gorgosaurus or an Albertosaurus (all tyrannosaurids). Although the tyrannosaurid diagnosis cannot be confirmed with absolute certainty and a definition down to genus level is not possible, the Tyrannosaurs dominate the apex predator positions within the Laramidia fossil sites. Perhaps as many as nine genera have been identified to date, the Late Cretaceous seems to mark the peak in the Superfamily Tyrannosauroidea diversity. Team members at Everything Dinosaur have tried to list the nine genera of Tyrannosaurs identified thus far from strata that represent Laramidia. Daspletosaurus (to read an article about face biting in potential Daspletosaurs): Cannibal Daspletosaurus? Palaeontologists have proposed that there was a great deal of dinosaur provinciality within the landmass of Laramidia. The idea of different parts of the landmass being home to different types of dinosaur has been studied for the last two decades. Unfortunately, due to the tectonic activity on the Pacific coast of western North America, it is difficult to determine where exactly in Laramidia this new tyrannosaur came from. It has been suggested that since the end of the age of dinosaurs there has been around 1,800 miles of tectonic displacement in roughly a northerly direction. This Tyrannosaur could have lived as far south as what is now southern California. Birds today lay many different sized eggs, the New Zealand Kiwi (genus Apteryx), for example, lays an egg that is up to 25% of its entire bodyweight. The Kiwi lays the biggest egg in proportion to its body size of any living bird. The Bee Hummingbird (Mellisuga helenae), which we at Everything Dinosaur believe to be the smallest species of bird alive today, lays an egg that is not much bigger than a garden pea. Palaeontologists know that dinosaurs laid different sized eggs too. The eggs of a giant Titanosaur being many times bigger than the eggs of a small dromaeosaurid. Confiscated dinosaur eggs taken from smugglers by Chinese customs. The picture above shows a selection of the 3,000 dinosaur eggs taken off smugglers by Chinese customs officials. The picture nicely illustrates the huge variety of dinosaur egg size and shape. However, birds today lay eggs not only of different sizes but of many different colours as well and until recently there had not been much research undertaken as to the pigmentation of dinosaur eggs. Why have white coloured dinosaur eggs? Pale or white coloured eggs would not necessarily help with camouflage, especially when you consider that due to the size of some of those dinosaur mothers, they could not have laid eggs in a secluded, hidden location. The chances are that many dinosaurs laid eggs in open and exposed places, hence the need to breed in colonies to afford some protection to their offspring. Two new studies have shed some light on the potential colour of dinosaur eggs, suggesting that they might have been blue-green instead of pale or plain white. One study conducted by scientists at Bonn University (Germany) discovered that two pigments that provide colour for extant bird eggs also existed in the eggshells of an oviraptorid dinosaur from China called Heyuannia huangi. H. huangi, was typical of the Oviraptoridae. Fossils of several individuals have been excavated from Upper Cretaceous sediments in Guangdong Province (southern China). The fleet-footed dinosaur was most probably feathered and measured a little over 1.5 metres long when fully grown (about 40% of its body length was made up of its tail). Thousands of small Theropod eggshell fragments have been found in association with the body fossils and it is thought that the sediments represent a H. huangi nesting site. The German study, which has yet to be peer-reviewed, concludes that the two pigments protoporphyrin and biliverdin, responsible for colouring chicken eggs brown and the eggs of emus and other birds blue, were present in the eggshells of this dinosaur. The German scientists also related egg colour to the type of nesting habit of the bird concerned. Birds that lay more open, exposed nests tend to have specific egg colours to help camouflage the eggs. The team suggest that based on this evidence, dinosaurs such as oviraptorids that laid open nests may have laid eggs that were camouflaged. Heyuannia huangi for example, could have laid blue/green eggs of a similar colour to that of an emu’s egg. The researchers also propose that the discovery of eggshell pigments may have implications on how the adult dinosaurs looked after the nests. Behaviours similar to extant birds could perhaps be inferred. This research builds upon an earlier study undertaken by a team of animal behaviourists at Hunter College in New York. Professor Mark Hauber, one of the lead authors of the scientific paper, published recently in the academic journal “Biology Letters”, and his team effectively mapped the presence of two pigments protoporphyrin and biliverdin and used the way they combine with each other and blend with the calcium carbonate of the eggshell to predict egg colour. The New York based team produced a series of computer models that plotted the ways in which these two pigments combine in various ratios and used these models to work out what colour eggs would occur as a result. Taken together these two studies suggest that different types of dinosaurs may have laid different coloured eggs just as birds do today. In addition, it seems that the ability to lay camouflaged eggs goes back a long way into the Mesozoic, with the dinosaurs evolving this ability which was then inherited by the Aves. Oviraptors may have laid camouflaged eggs. Could it be time for Papo, to change the colour of the dinosaur egg that their model Oviraptor is grasping in its claws? A Papo Oviraptor with a blue egg. Great for imaginative, creative play, a set of six rubber dinosaurs from Everything Dinosaur. An ideal gift for the young dinosaur fan in your family or as a play set for use in schools. The set of six dinosaur models includes a Tyrannosaurus rex, a long-necked Brachiosaurus, the plated dinosaur Stegosaurus, along with a bright and colourful duck-billed dinosaur, a Parasaurolophus. The set also includes a horned dinosaur (Triceratops) and a wonderful armoured dinosaur, an Ankylosaurus. This set of soft rubber dinosaurs makes an ideal my first dinosaurs model set as these prehistoric animals are suitable for children from three years and upwards. A set of six rubber dinosaurs, great for tactile play. The teaching team at Everything Dinosaur have specially chosen this toy dinosaurs set as the models represent typical examples of dinosaurs and show the variety of these ancient reptiles that once roamed our planet. The models are made from soft rubber and they are great for imaginative, tactile play. This really is a super set of soft and squeezy rubber dinosaurs. The set makes an ideal, my first dinosaur model set for any young dinosaur fan. They are a great way for young minds to explore materials and discover the world of dinosaurs. Thanks for your review Mrs Jacobs. Everything Dinosaur supplies a set of useful dinosaur fact sheets about the animals featured in this set. This is a great dinosaur themed resource for schools. A team of international researchers have got up close to a prehistoric parasite, one that is perfectly preserved along with its 425 million-year-old host. The ancient parasite, known as a “tongue worm” provides scientists with a glimpse of life and the interactions between species in a warm tropical sea that existed in Britain back in the Middle Silurian. Fossils of tongue worms are extremely rare, examples have been recovered from Ordovician as well as older Cambrian deposits, the Silurian fossils are exceptionally well preserved, we at Everything Dinosaur believe the fossils to be part of the Wenlock Epoch biota. The actual location of the fossil find has not been disclosed in order to protect the site from amateur fossil hunters and those keen to exploit the fossil deposits commercially. The fossils come from a deposit in Herefordshire, close to the border with Wales, scientists from the University of Leicester, who took part in the study stated that the tongue worm represents a new species and they range in size from 1mm to 4mm in length. Tongue worms have tongue shaped bodies, a distinct head and two pairs of limbs. At least 140 species are known to exist today, most are respiratory or gut parasites of vertebrates (usually reptiles), these fossils provide scientists with information on how these creatures evolved before they made the move onto land to become parasites of terrestrial vertebrates. Looking at the micro-fauna of the Silurian. The picture above shows the pentastomid Invavita piratica and its host, the Ostracod Nymphatelina gravida. The newly described fossils show the tongue worm species in association with its host, in this case a species of Ostracod (an Arthropod). It was professor David Siveter, (Department of Geology) at Leicester University, who made the discovery. An academic paper describing the new species, named as Invavita piratica, (the name translates as ancient, pirate intruder) has been published in the journal “Current Biology”. As well as academics from the University of Leicester, the research team included scientists from Imperial College (London), Oxford University and Yale. Tongue worms belong to the Pentastomida Family, part of the Subphylum Crustacea, although for many years the taxonomic relationship between this group of obligate parasites and other parts of the Arthropoda was disputed. Professor Siveter, explained that the tongue worms were not “worms” at all, they got their name because one genus resembles the tongue of an animal. They are an unusual and widespread group of mainly obligate parasites. An obligate parasite is an organism that cannot complete its life-cycle without finding a suitable host. Internal parasites identified by high powered scans and computer modelling. The computer image above shows the Ostracod with its shell removed, showing the external pentastomids and a pentastomid near the eggs of the Ostracod (parasites in orange). The picture shows how this group of parasites got their name. “Penta” refers to the number five and these parasites have five anterior appendages. One is the simple mouth, the others are two pairs of hooks which they use to attach themselves to their host. The large pentastomid (top left) is a highly magnified image of a single parasite, not to scale with the rest of the image. Using sophisticated microscopic scanning techniques and three-dimensional computer modelling, the scientists were able to reconstruct the Ostracod and its parasites. Some of the tongue worms were found inside the Ostracod’s shell , near its eggs, on which they probably fed. Other tongue worms are attached to the external surface of the Ostracod’s shell, a unique position for any fossil or living tongue worm. These tiny fossilised creatures are helping the scientists to understand a little more about inter-relationships between parasites and potential hosts in ancient marine environments. Back in 2012, Everything Dinosaur reported on the discovery of another ancient Ostracod from the same location. The fossil had been identified using the same techniques to discover the parasites. Professor Siveter, named this new genus of Ostracod after his wife. It feels like we started this blog sometime back in the Pleistocene Epoch, but that’s not quite the case, the first articles were published in May 2007 and now some eight years later, today, we publish article number 3,000! Team members at Everything Dinosaur try to put up an article every day, this can be quite a tough ask but given the speed of developments in palaeontology, the wealth of new fossil finds plus of course, our own adventures, there has never been a shortage of things to write about. A big thank you to the millions of viewers and all those who have re-pinned, shared and tweeted our content, this really means a lot to us. Celebrating our 3,000th blog post. The aims of our humble web log have not changed since we started. We try to write articles using non-technical language that inform readers about the latest dinosaur and prehistoric animal research. In addition, we act as a source of information for new fossil finds and updates on fossil hunting expeditions. Our blog has proved to be a useful resource for dinosaur fans and model collectors as we have published quite a lot of information about new products and ranges coming to the market. From the feedback we receive, we are also aware of the number of teachers, teaching assistants and home educationalists who regular visit our blog site and use the information we provide for lesson plans and other educational activities. With this blog and our sister site (Dinosaurs for Schools), Everything Dinosaur has built up quite a following from primary and secondary school teachers. The Everything Dinosaur blog is getting to be quite a sizeable beast, for example, much bigger than a Dreadnoughtus, a huge, long-necked dinosaur from Argentina, that we discussed on this web log back in September 2014. If you were to print out all our articles out onto A4-sized paper and lay them end to end, then this paper chain would stretch for approximately 750 metres. Or to put it another way, in terminology that dinosaur fans might appreciate, our printed out blog would stretch the length of twenty-seven Diplodocus dinosaurs. If we were to try to print out our entire blog, even on our biggest, fastest printer, we estimate that to produce all the articles, it would take over two days. That’s a lot of time standing around the printer! Given the amount of correspondence we receive from collectors, schoolchildren and delighted parents, we could quite easily post up pictures, drawings, photographs of fossils and such like several times a day, but for the time being, we shall have to limit ourselves to the single post. However, please be assured, we respond to all those correspondents who require a reply, just as we read all the blog comments from our readers on this site. On behalf of everyone at “Everything” we would like to say a really big thank you to all our readers. The huge Hall Dale Quarry near Matlock, Derbyshire, could be transformed, with the potential loss of an amazing fossil location, if the local authority grants permission for a mixed residential and commercial development on the site. Hall Dale Quarry is a disused limestone quarry. We at Everything Dinosaur, don’t know when the quarrying of limestone blocks ceased, what we do know is that the rocks exposed at this location contain a huge diversity of Carboniferous invertebrate fossils. Fossils are extremely common at the quarry, whilst many amateur collectors split the boulders with heavy-duty chisels to access the fossil material, just a few minutes exploring the scree on the quarry floor will yield plenty of specimens. Fossils of a variety of Brachiopods, Crinoid stems and large Corals litter the site and with careful searching some nice examples of marine Gastropods (mainly internal moulds), can be discovered too. The strata represents a shallow, marine environment and the rocks at the quarry are part of the Eyam limestone formation. They date from the Early Carboniferous (Visean faunal stage of the Middle Mississippian Epoch [345-328 mya]). The site is hidden from the road and is approached via a small path leading through a wooded area, although it is just a few minutes’ drive from the bustling centre of the Derbyshire market town of Matlock, once at the quarry face, it’s a different world. On the day Everything Dinosaur visited, the quarry was deserted, we did not see a single person for the best part of three hours. The rock strata forms a series of platforms (three in total), Hall Dale Quarry is a popular location with climbing clubs, the sheer rock faces and huge piles of stone provide plenty of different climbing routes to explore. We would advise that fossil collectors stay on the ground level, there are plenty of fossils to be found and there is no need to climb the boulders. Huge boulders – can you see our rucksack? During our research, prior to our fossil hunting trip, we visited the excellent website of UK Fossils: UK Fossils. As we prepared for our visit, we came across a news article from November 2014 that outlined plans for the development of this rural space, what is termed a brownfield site. 4M Property Partners had submitted plans to convert the quarry into a development consisting of mixed residential and commercial properties. Plans had been submitted to the council to build some 220 houses, and to convert 400 square metres into a restaurant and a café. In addition, the planning proposal contained details of some 6400 square metres of office space. We at Everything Dinosaur are not sure exactly how fossil collecting would be affected by these developments, we are also unsure as to how the planning application has progressed. However, we would like to express our concern that such an amazing place might be lost forever. Whilst we can appreciate that Matlock, like many towns in the UK, may have a need for more houses and that such a development might boost the local economy, as we stood in the quarry, totally in awe of the spectacular scenery and surrounded by evidence of a tropical, marine environment that existed some 340 million years ago, it seemed such a shame that this location might soon be unrecognisable. Fossils can be found in the scree. There may be an urgent need for more local housing. The town of Matlock might desperately require additional commercial properties. We feel that we are unable to comment with regards to these development plans, but we sincerely hope that the developers have at least considered the need to preserve some part of this remarkable location’s fossil heritage. There are fewer and fewer places in this country, where people can simply stop and stare and admire rock formations and the fossil treasures they contain within. These special sites demonstrate the rich geology of our landscape and allow visitors to explore life in the past. We hope that any development is undertaken in sympathy with the astonishing geology of this location. A multitude of fossils can be picked out from the scree. Wishing to express our concerns, the team member who visited the site contacted the planning department of Derbyshire Dales District Council. A very helpful person in the department explained that the planning team could be emailed, allowing concerns about the need to develop the location in sympathy with the geology of the area to be put on record. Everything Dinosaur subsequently did this and in addition, emailed Natural England to raise awareness of the development of this brownfield site with that organisation. If you have collected fossils at Hall Dale Quarry and wish to make a point with reference to the re-development of this site and the potential loss of this fossil collecting location, then we would urge you to do so. Planning application reference: 14/00541/OUT (please quote this reference when emailing the planning department or Natural England). Whilst we do understand the difficult and often challenging job of district councils and we aware of the potential economic benefits to the local community this project may bring. We at Everything Dinosaur feel that it is important, to at least place on record a desire to consider the development of Hall Dale Quarry which takes into account the remarkable fossil bearing strata to be found at this location.